The Brunswick catchment comprises a string of small coastal catchments north of Byron Bay. The catchment's rivers and creeks flow through rural valleys into lakes and estuaries that support extensive wetland areas. The Brunswick catchment is on the far north coast of NSW. It borders the Richmond catchment to the south and the Tweed catchment to the north, extending along the coastline from Cape Byron north to Kingscliff. It encompasses a number of small independent catchments – mainly Cudgen Creek, Cudgera Creek, Mooball Creek, and the Brunswick River. The Brunswick is a small catchment of just 520 square kilometres. Elevations rise steeply across the catchment from sea level on the coast to around 700 metres in the Burringbar and Koonyum Ranges, which form the western and southern boundaries of the catchment. The Brunswick catchment has a relatively high density of rural settlement driven by people seeking a coastal or rural lifestyle away from the cities. The main population centres are Byron Bay, Mullumbimby, Ocean Shores, Pottsville and Brunswick Heads. These centres, particularly Byron Bay, also attract large numbers of tourists to the area. The Brunswick River begins in the Burringbar Ranges and drains an area of approximately 280 square kilometres. Its major tributary is Mullumbimby Creek which enters the river near Mullumbimby. From Mullumbimby the river comes under the tidal influence of the estuary. The Brunswick estuary covers 2.9 square kilometres and comprises three primary arms – the Brunswick River, Marshalls Creek and Simpsons Creek. 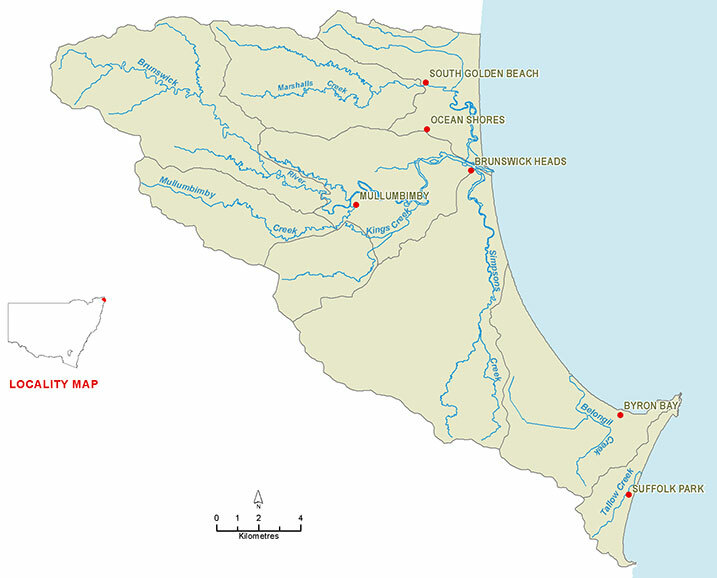 Near Byron Bay are the catchments of Belongil Creek and Tallows Creek. Both are small intermittently closed and open lagoons with small local catchments. Mooball Creek drains an area of 109 square kilometres. Its major tributaries, Crabbes Creek and Burringbar Creek, flow east from the Burringbar Ranges through rural valleys. On the coastal plain they join to form Mooball Creek which enters the sea at Pottsville. Cudgera Creek has a catchment area of 60 square kilometres. The main tributaries of Cudgera Creek and Christies Creek originate in Mooball National Park and flow east to form a small estuary behind the sand dunes. Cudgera Creek enters the ocean at the small village of Hastings Point. Cudgen Creek has a catchment area of 66 square kilometres. 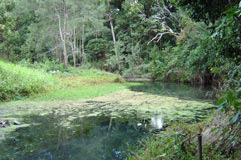 A major feature of the catchment is Cudgen Lake, a shallow freshwater lagoon which is fed by Reserve Creek and Clothiers Creek. The lake drains into Cudgen Creek which meanders behind sand dunes for nine kilometres before entering the ocean at Kingscliff. View real-time data from the Brunswick catchment on this website. Water is used for a variety of purposes including stock and domestic, cropping and horticulture. Land use over the coastal plain is dominated by grazing with cropping and horticulture comprising the next most extensive land use. Irrigation is used mostly for pasture production but is also used for tropical fruits, nurseries and turf growing. Town water supplies for the major urban centres are sourced from storages in the adjacent Richmond catchment. Due to a high density of rural settlement, the region's rivers and estuaries tend to be affected by changed run-off conditions caused by land clearing and agricultural use, urban development and recreation. Many streams on the coastal floodplain have been straightened and channelised. Most of the rivers and creeks in the Brunswick River basin are unregulated, without major storages to capture and control flows. As in most unregulated rivers, there is high pressure on river flows during relatively dry times, when water is low and demand high. The Upper Brunswick River is regarded as a stressed river with a high potential demand for extraction relative to the natural flows in the creek. Water sharing plans have been introduced to balance the needs of water users and the environment. Over 20 square kilometres of wetlands along the coastal zone of the Brunswick catchment are protected under State Environmental Planning Policy 14. The largest of these are Cumbebin Swamp at Byron Bay, Billinudgel Creek, swamp forest at Mooball Creek, and extensive wetlands associated with Cudgen Lake and Cudgen Creek. Billinudgel Creek and Cudgen Lake are listed as nationally significant in the Directory of Important Wetlands in Australia. The coastal plain of the Brunswick catchment has been extensively cleared. Remnants of Big Scrub lowland rainforest that previously covered 750 square kilometres of the far north coast, are to be found south of the catchment. Less than one per cent of this endangered ecological community remains today.